Long ago, Henry Ford suggested, “Whether you think you can or think you can’t, you’re probably right.” With all due respect to a positive attitude, however, the fact remains we all need to renew our mental, physical, and emotional energy and that is especially true in today’s highly competitive and increasingly more stressful business world. In other words, in an optimistic workplace, people are energized by each other. It is no coincidence that most of the companies annually ranked among those that are most highly admired and best to work for are also annually ranked among those that are most profitable and have the greatest cap value in their industry. I agree with Murphy that companies such as these have workplace optimism. 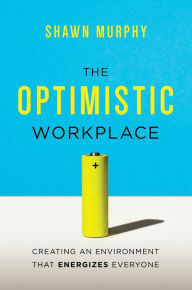 He observes, “The proliferation of optimistic workplaces is undoubtedly linked to the talents and willingness who supplant the beliefs of management for those of stewardship.” All organizations need effective leadership at all levels and in all areas of the given enterprise. Leaders who are stewards are viewed as authentic, guided by what Jim O’Toole characterizes as a “moral compass” and by what Bill George characterizes as their “True North.” They see themselves as being what Robert Greenleaf calls servant leaders. Those who share my high regard for Shawn Murphy’s brilliant book are urged to check out two others: Michael Lee Stallard’s Connection Culture: The Competitive Advantage of Shared Identity, Empathy, and Understanding at Work, written with Jason Pankau and Katharine Stallard, and, Freedom, Inc.: Free Your Employees and Let Them Lead Your Business to Higher Productivity, Profits, and Growth, co-authored by Brian M. Carney and Isaac Getz.